So, Malabrigo is having a contest! How exciting is that? The contest is featuring their super-nommy sock yarn. I happen to have a large stash of Mal sock so I of course had to come up with something to submit. I went with another children’s design that I have had floating around in my head for some time. About a year ago, I was perusing a Barbara Walker stitch dictionary and I came across a lovely slipped stitch cable called Slipped Hourglass. I fell in love and decided that I needed to find a place for it. Well, then I got thinking about a top-down sock weight tunic and it just fit perfectly. I had decided that this would be a girls only design when one of my test knitters told me she was knitting it for her son. I got to thinking, “duh!” of course it could be a boy’s sweater too! So, with a few mods, it will be both a girl’s and boy’s pattern. I just have to finish the boy’s sample by October 31st. Well, here is a shot of it in it’s girl form. Isn’t she adorable? I am really excited about this pattern. It’s with test knitters right now and some of them are plugging away on it. I can’t wait to see some finished objects. That always makes me smile. Tonight is a big night too for all you junkies out there! Mal Junkies, I mean. October Stockpile starts tonight at midnight! So get out your needles, knit away and try to win some prizes! I will not be defending my most finished objects title this year. I am also planning a pattern release tomorrow. So, I will surely post about that! Yes, I was going to put up another post this weekend. But, instead I painted my toddler’s room. I took a weekend off from knitting and dove in, head first, to a major painting job while my significant other was off on a bit of a vacation. I am not sure what got into me. But, it was lots of fun! Sorry the below picture is so bad, but I took it at about 10:30 last night. We painted the entire room and ceiling first. It was white. We painted it a lovely sky/water blue. Then, yesterday morning my lovely and talented daughter and I, stared the mural. I have decided to decorate my son’s room in a pirate/sea theme. 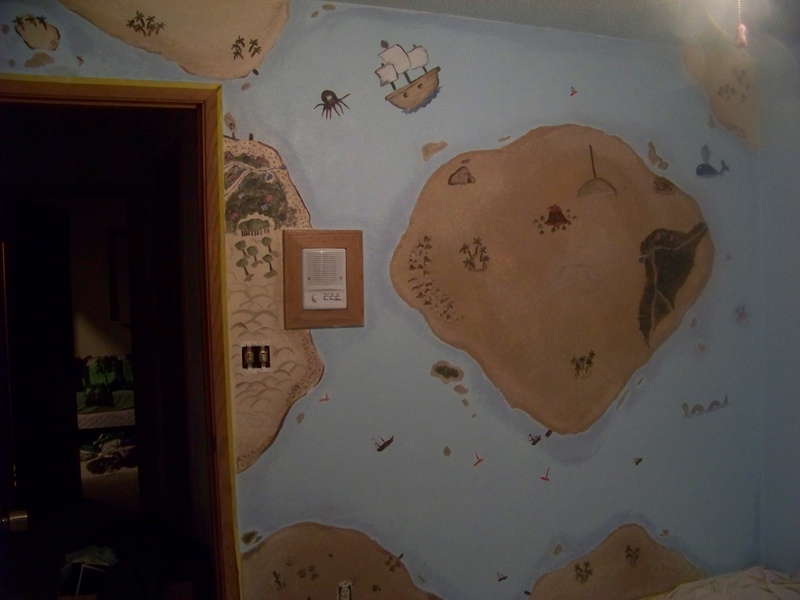 So, I planned on one of the walls being a treasure map mural. I seriously underestimated how much work this would be! Now, onto knitterly things. I told you I would post about this. So, here it is! Remember that big cozy cowl I was working on for a Jimmy Beans Wool contest? Well, I didn’t win the grand prize, but I think the prize that I did win is still pretty fantastic. The pattern for the cowl is here and it is FREE! Yep, that’s right, completely free! Go get it! Working up a Sweat(er) or two! Well, ok three actually. Yes, I am working on three sweater patterns at the moment! I gave you all a sneak peek of the my Rios sweater last time. This time I have modeled pictures. I got the weather and my son to cooperate all at once! This sweater pattern is very close to being finished. I went over my tech editor’s notes yesterday and am just waiting for a few testers to weigh in. So far all is well! So, I will let you see a couple of the modeled pictures! 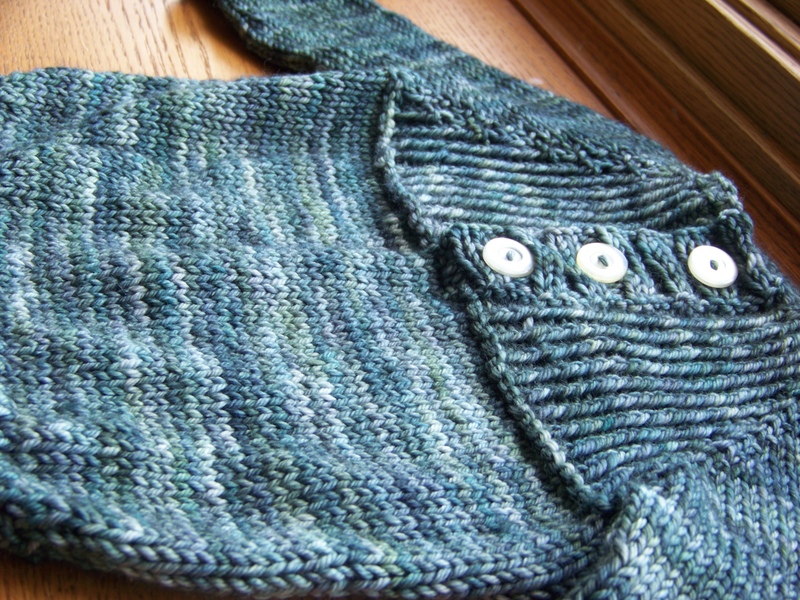 You can really see the twisted rib detail on the yoke in this picture. We had been calling the sweater, Santino. But, I came across better inspiration. The sweater will be named Kinsale after an Irish port town frequented by British and Irish vacationers. The views of the town are quite lovely and there is water everywhere. I used the colorway Aguas. So, it seemed to be a good fit. 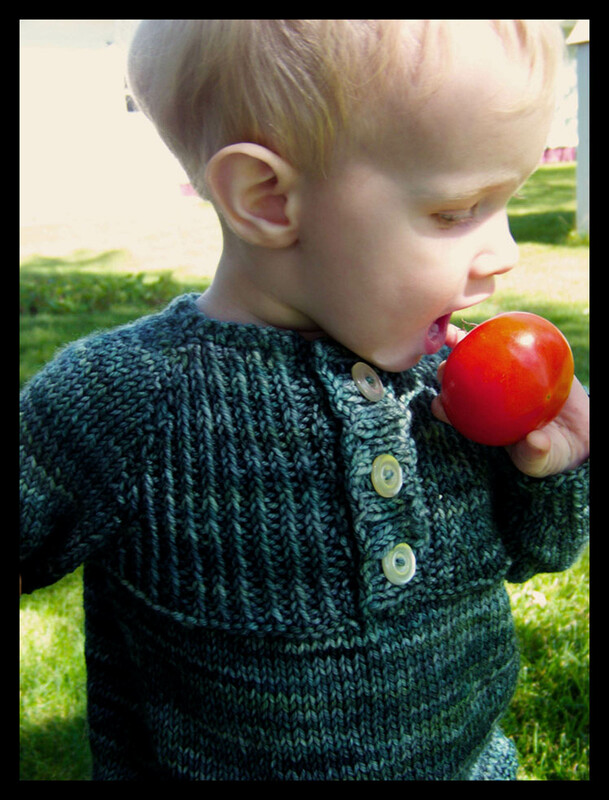 Besides, Santino is a decidedly male name and the sweater is really unisex. Isn’t the colorway gorgeous. 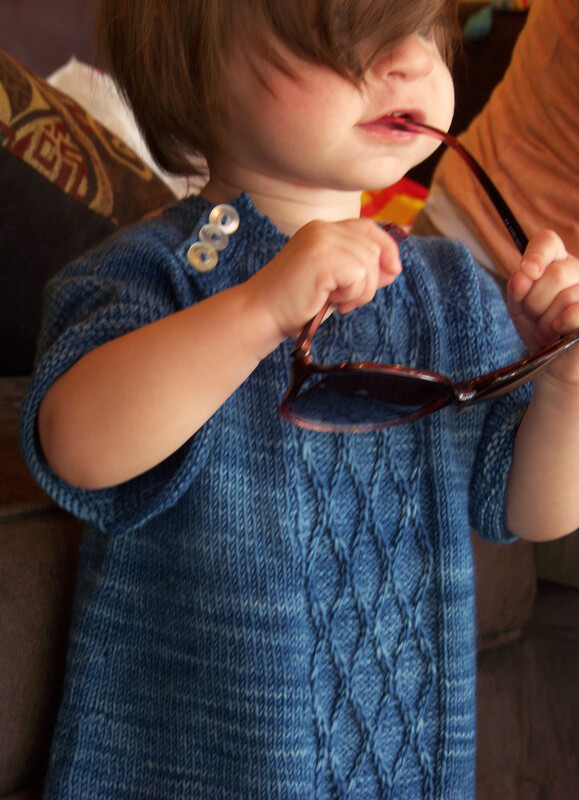 I think Malabrigo Rios will be great for babies and children! I have been so busy! I have knit three sweaters in just a week and a half. Yes, they were toddler sizes but one was in sock yarn!!! I really need to schedule this blog into my day. But when deadlines call, the deadlines win every time! Things are going great around here. But, I thought I should probably post before they start to get hectic again! My Rios sweater has gone to testers as of yesterday. It came out really cute as you can see by this picture. 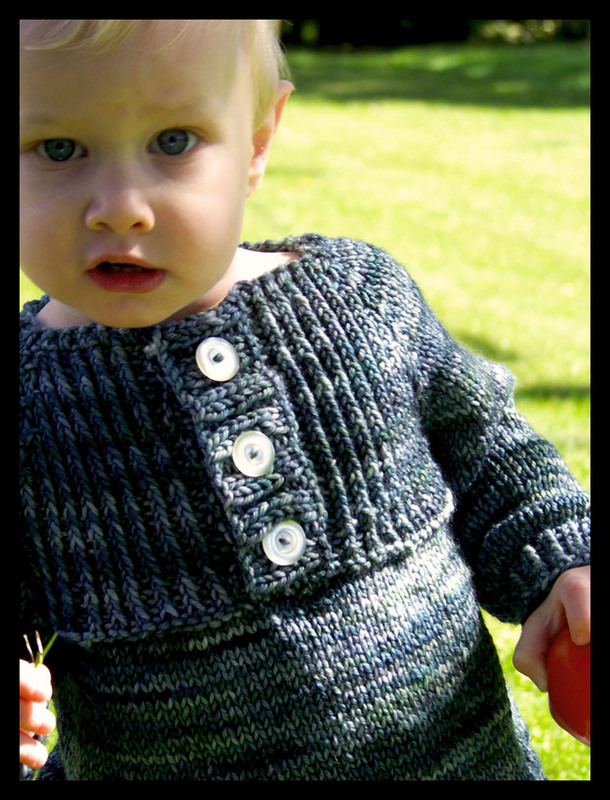 The colorway for this sweater is Aguas. It is so gorgeous! This yarn knits up like a dream. I think it will be perfect for baby and kid’s garments. I just absolutely love it. Talk about soft too. It’s really soft! I also just finished the sample for my entry for Malabrigo Sock yarn contest. It came out really cute! Hopefully, I will have a picture of that soon too. For now, I hate to blog and run but I have a photo shoot!